Being involved in a motor vehicle crash can be a traumatic experience filled with the difficulties of knowing how to care for the health of yourself and your loved ones, along with the many legal questions that become essential in protecting your financial future. This is a question we all prefer to answer away from the scene of a crash. Emotions run high in these moments, and because a collision with injuries requires a focus on safety and survival, it’s critical to have tools available to take you through the steps you need to cover for your own protection. Leaving can constitute a hit-and-run, which can have serious consequences, particularly when injuries are involved. Whether the accident was your fault or the fault of another driver, stay put until police tell you it’s okay to leave. Check for those in your vehicle who are injured, then check those in the other vehicle/vehicles if you can. If injuries have occurred, summon medical assistance. If a vehicle is in imminent danger of being struck by oncoming traffic or fire, remove the person from that vehicle to a safer location if possible without putting the injured person or yourself at greater risk. Tell 911 the details of the dangerous situation. 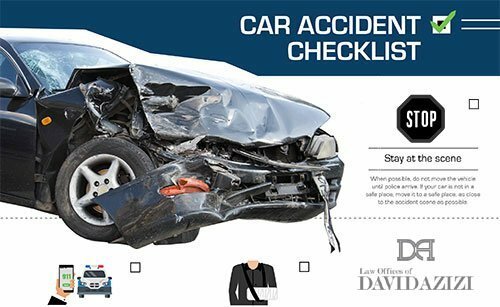 Accidents that result in injuries, deaths or serious damage to vehicles require that you call the police to assist. If traveling on the highway or outside a city, call the California Highway Patrol. When police arrive, request the names and badge numbers of investigating officers and write them down. Even if your injury does not seem serious at first, symptoms can show up hours or days later. It is important to keep track of your medical treatments, including emergency room visits, prescriptions, X-rays and rehabilitation therapy visits. In addition, keep all your medical appointments. By not doing so, it might appear that you were not really hurt. The goal is not only for physical recovery, but to document that you are taking the steps outlined by a professional. This helps to establish and demonstrate your injury claim and why you might be owed additional compensation for lost wages and other damages. As soon as you are able, take photos of vehicular damage and the position of all the vehicles in the crash. It’s also a good idea to take photos of any debris on the roadway and skid marks, scuff marks, yaw marks or other imprints left behind, on the roadway or shoulder of the road. Such marks help indicate the path other vehicles took. For instance, skid marks can indicate that tires were not revolving at the time the marks were made, and this can be caused by a driver applying the brakes too hard. An attorney can use expert opinion to determine the speed of the vehicle by the length of the skid marks left behind, and show that a vehicle was traveling at an excessive speed when the accident occurred. Because skid marks are an important part of an accident investigation, they should be photographed as soon as feasible. In addition, the lack of skid marks can show that driver did not brake at all. Obtain license plate numbers from the other vehicles and get the names, addresses, phone numbers and insurance information from any drivers involved in the accident. Get names, addresses and phone numbers from passengers in the vehicles also. Don’t say anything such as “I’m so sorry this happened” because it could be misconstrued as an admission of guilt that the accident was your fault. Just as with the drivers and passengers in the other vehicles involved in the accident, ask witnesses for the same information. In addition, ask them what they saw when the crash occurred, and jot down notes on their response, or use a cell phone to record what they say. This task will often be done by police officers at the scene, and can also be completed by a car accident law firm. Call your insurance company as soon as it is practicable. Just give them the basic details of the accident. Do not fabricate anything since lying can result in non-coverage for the accident. If the insurer starts to ask questions that you do not feel comfortable answering or questions that imply fault on your part, let them know an attorney will be calling. Car accident cases involve some very detailed work including crash investigation, communication and negotiation of financial settlements with insurance companies, gathering, preserving and presenting admissible evidence to a judge and jury, and experience to know what amount of money will most likely be awarded based on previous cases of a similar nature. You could go it alone, but this might be compared to performing your own surgery. It’s extremely risky and best to take a look at how those results actually play out — usually not very good. 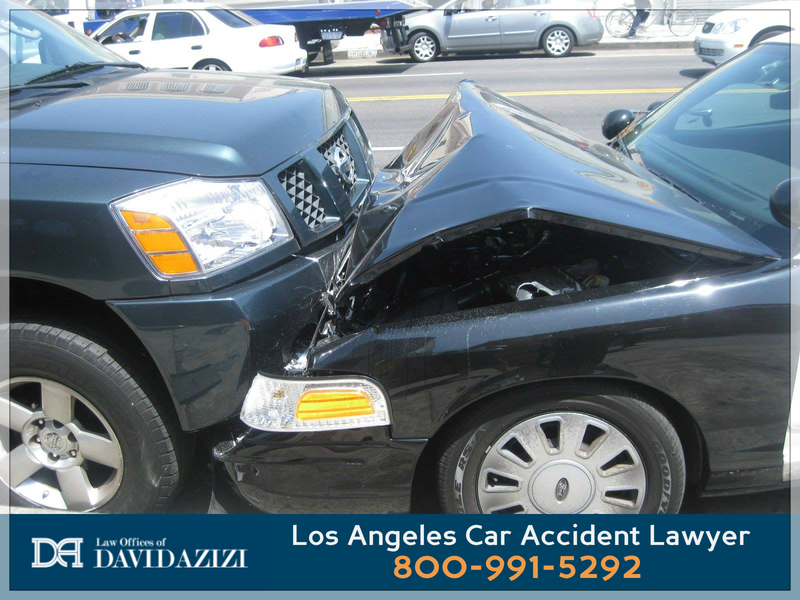 David Azizi and the Los Angeles car accident lawyers practicing at the firm can protect your rights and help you recover maximum compensation for your injuries. 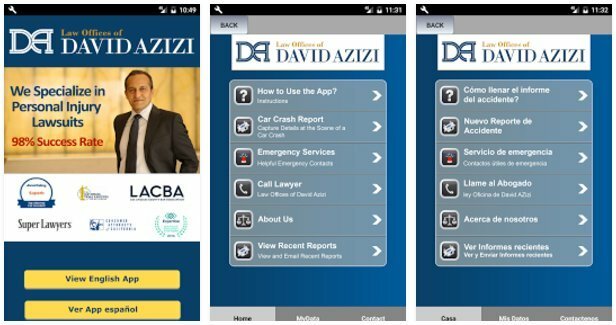 Even if you were partially at fault in the accident, you are still able to recover a percentage of the damages. Since David works on a contingency basis, this means the law firm will front all investigation costs, court fees and beyond. You will not pay anything unless and until you’ve won your case and collected compensation. Call (800) 991-5292 24/7 to set up a free, no-obligation case review to begin developing your strategy. We will answer your questions while we lift the burden of dealing with insurance companies and recovering what you need to put this ordeal behind you.